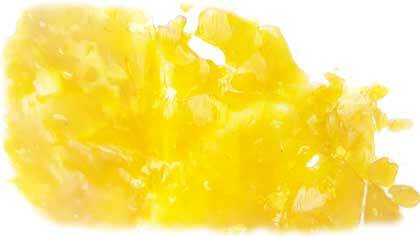 Wax is an herbal concentrate most often referring to a legal cannabis concentrate or butane hash oil (BHO). It has a waxy texture hence the name. BHO wax comes in different grades from yellow-colored live resins being the best grade to dark-colored waxes on the lower end. The good news is that no matter which one you have, you can turn the wax into e liquid and vape it in any vape tank! For this article, I am going to explain how to turn one gram of wax into e juice using a Farm to Vape Kit. You can use less wax at a time if you'd like, and use an equally smaller amount of Farm to Vape. We've mixed 0.25 grams of wax with 0.75 grams of Farm to Vape to fill a 1 ml tank countless times for testing. It's all the same ratio of wax to Farm to Vape Thinner; one gram of wax to three grams of Farm to Vape. This is also the same if you're turning shatter into e juice. Now let's get started. 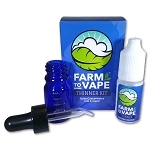 First, you add one gram of concentrate to the glass boilable dropper bottle included in any Farm to Vape kit. You may have to freeze the wax for a few minutes to make it more solid to remove it from the wax paper it came in and allow for easier handling and placement into the bottle. It sometimes helps to moisten the ring of the bottle with a couple drops of Farm to Vape to allow the concentrate to slide into the bottle and not stick. Next, fill the dropper bottle to the rounded shoulder with Farm to Vape. This equates to a little over a 1:3 ratio of wax to Farm to Vape, to allow the mix to work great in any vape tank. These ratios are approximate -- if you're using an oil hole vape tank, you can make the wax e juice mix a little thicker. Now close the cap, and place the wax e juice mix in boiling water for three minutes. Then remove and shake it. I use a towel to insulate from the heat, it's hot, it just came out of boiling water! Now it's time to fill your tank and vape it. Every tank opens up differently so lefty-loosy, righty-tighty is the best we can help you there! The eye dropper in the lid of the boilable dropper bottle allows you to easily fill any type tank. Make sure you start at a low temperature first and raise the temp as needed. Now you are good to go! Enjoy your discrete vaping experience! The best wax works with farm to vape , as to be used in edible flavor . Thanks and regards . Kindly reply soon and oblige . What is on it? Is it healthy? Harmful to lungs?